This weekend (Sunday & Monday) the wife and I met up with Frank Morgan of drinkwhatulike.com and Dezel Quillen of myvinespot.com for some Monticello wine tasting. We went to Mountfair Vineyards, Pollak Winery, King Family, Delfosse and Blenheim and had a fantastic time. We met with winemakers and/or vineyard managers at all places and got a good taste of how the ’09 vintage went. Tasting many barrel and tank samples of ’09 juice, we were all quite impressed with what is in store for the vintage, and frankly I can’t wait for it to be in bottle. I’ll have some posts soon with details of each visit but I wanted to put up a picture montage in the mean time. 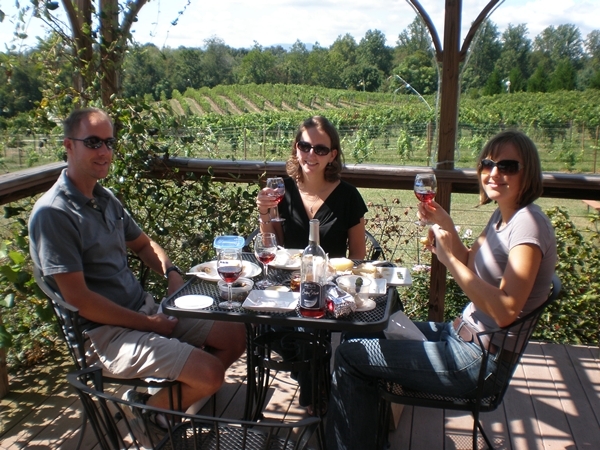 It was a beautiful weekend in Virginia this weekend, and Sunday was a great day to enjoy Virginia Wine Country. We started out with a trip to Gadino Cellars, in Rappahanock County. It had been a few years since our last visit, so we figured it would be good to revisit their offerings. Gadino Cellars keeps production low, below 1500 cases, on purpose to focus on quality small lot wines. Gadino is a complete family operation, and we had the pleasure this time around to meet Stephanie, assistant winemaker and tasting room manager. We talked wine business for a while, and among other things she let us know the 2009 Vintage was looking good and the Seyval Blanc was brought in last week. We tasted 10 wines (Free if you are a returning guest or $5), and I definitely had a couple of favorites. 2007 Viognier (5 months Hungarian Oak) $19 – nose highlighted by peach and nectarine, with a taste profile of Asian Pear, honey suckle and citrus. Medium bodied, good acidity with decent length finish. 2007 Moonrise Rose (54% Cabernet Franc, 31% Cabernet Sauvignon, 15% Viognier) $16 – with less than 1% residual sugar this a great fruit forward dry Rose, great for a picnic as you can see for our picture below! Filled with aromas of strawberry, watermelon and red currant, the fuller than expected body transports similar flavors to a dry, slightly flinty finish. 2007 Cabernet Franc – Riserva (88% Cabernet Franc, 12% Merlot) $24 – Nose was a bit tight, but opened after some intense swirling to predominately red fruit notes of raspberry and red currant. The palate was much more open and provided cherry, leather, green bean and slight vanilla notes with just a touch of toasty oak. Full bodied and slightly spicy – look for this to improve for the next couple years. After we tasted we enjoyed a bottle of Moonrise Rose with our lunches, while sitting on the Gadino Cellars deck. Thanks to the Gadino staff, we had a lot of fun, hope to see you soon. In a recent article on CNN’s travel site titled 4 Wine Country Contenders, Virginia was named as a hot spot for wine travel. 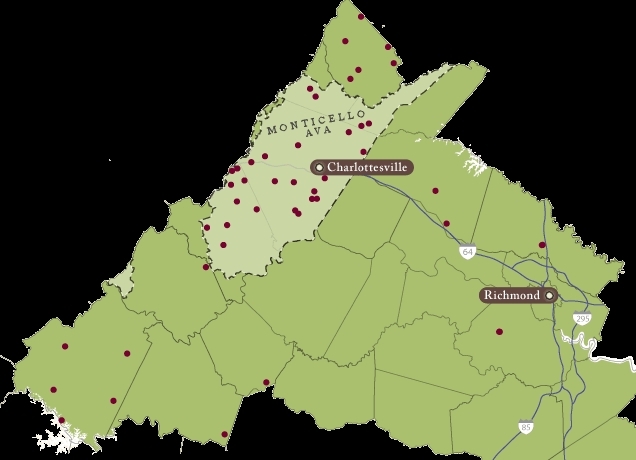 Specifically mentioned was the Charlottesville area and the wineries that dot the countryside in the Monticello AVA. “Virginia’s premier wine country, dotted with working farms and over 1,000 acres of grape vines, spreads out around the city of Charlottesville in the foothills of the Blue Ridge Mountains. Click here for the full article that also mentions, Walla Walla, Washington and Anderson Valley, California. If you have been following me on Twitter or Facebook, you probably know that Megan and I were up in Northern Virginia Wine Country for the past few days. We visited a total of 9 wineries over the weekend, 6 of which were completely new to me (this was actually part of the point of the trip since Loudon County is a bit of a hike for a day trip). 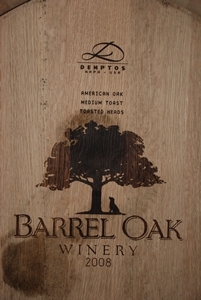 I first wrote about Barrel Oak over a year ago, before the winery had even opened. We were invited up by owners Brian and Sharon to talk about their new project and the vision for Barrel Oak Winery (BOW). Now as they celebrated 1 year of being in business, we hung out with Brian, Sharon and Rick Tagg, talking about the past year, the new plantings and sampling both the wines at the tasting bar as well as those in progress in the barrel room. The first vines planted are under their 3rd leaf, and the hills surrounding the winery are now completely covered by vines, but the wines we tasted were produced from purchased grapes. The vibe at BOW was hopping and there was not a face without a smile on it in the entire place, including the staff. Brian and Sharon have a true joy for what they are doing and it is infectious to say the least. I didn’t take a ton of notes from the barrel tasting but I loved the Cab Francs, the Petite Verdot and their Viognier was killer. I look forward to seeing how these wines progress into bottle. 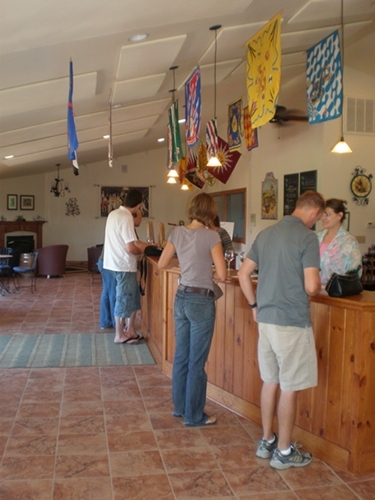 Thanks again to Brian, Sharon and Rick for showing us a great time as well as Kim who was our tasting room assistant. This was my first visit to Vintage Ridge, although I had wanted to go several times but always seemed to be in the area when they were closed. I was really excited about their concept of pairing wine and food together during the tasting, and didn’t realize how “intense” the experience was going to be. I imagined that they would give visitors a couple of cheeses or meats as pairing suggestions, but the actual experience was far more elaborate. The tasting was conducted in more of a restaurant style– you actually sit at a table and the wines are poured one by one along with an amazing platter of cheeses, sauces, mustards, nuts and even a mini Panini (it also came with meat, but we requested our plate sans meat). Although the experience was fun and I was looking forward to it, I think I would have just rather done a tasting without the pairings (particularly since each tasting cost $12 and you are expected to tip your “waitress”). I don’t think they offer a wine tasting alone, though–we were told “they do things differently here” and weren’t given an option to just taste the wine. They were quite busy, so I won’t complain too much about attribute the time between wine pours (the entire experience took about an hour, with little information or dialogue about the wines). I do have a couple of complaints, though. First, the foods, although very good, for the most part didn’t highlight the wines at all and actually detracted from most. The most absurd pairing was the hot, spicy mustard with Petite Verdot. Luckily I had tasted the PV before the mustard wrecked my palate, but if it is any indication of the PV quality, we actually chose to purchase the mustard (which incidentally was sold out). 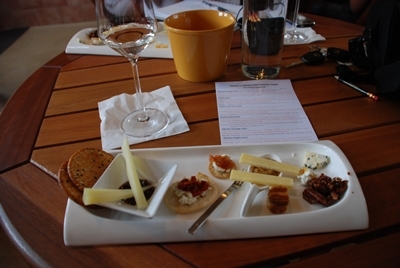 While the winery provides a FUN experience which people really seem to enjoy, the pairings were poor and made it difficult to evaluate the wines in and of themselves. My second complaint will actually be the topic of a separate post later this week, though I feel I should mention it here, as it sparked the issue for us over the weekend. The winery owner actually poured one of our wines, so I took the opportunity to introduce myself as being part of a Virginia Winery, a wine store manager that sells VA wines, and a wine blogger. Surprisingly, the conversation ended there without further dialogue—the owner didn’t ask which winery I was associated with, the name of my wine shop, or about my wine blog. At the time I assumed that he was merely too busy at the moment and would stop back by over the next hour as the tasting room thinned out–NOPE! 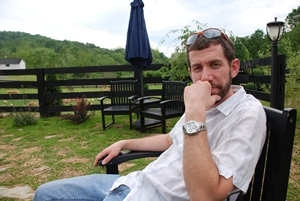 Not once did he come back by to talk, despite the fact that we work in the same industry, I could possibly put his product on a wine store shelf, and I could write about his winery on my blog, which gets steady readership among VA wine drinkers. I really couldn’t understand this, and was honestly baffled! I don’t remember the name of the woman doing our pouring but she was very nice, relatively knowledgeable, and had a smile on her face the entire time despite the fact that she was extremely busy. We heard about Aspen Dale while we were at Barrel Oak—Aspen Dale was celebrating their grand opening that very day, so the folks at Barrel Oak asked us if we had heard about it (there was little or no fanfare or publicity around their opening). Intrigued, we snagged some directions from an email that Rick Tagg had, and after Vintage Ridge made our way over to check out the new “speak easy”. The place is an adorable old restored barn that has tons of charm and unassuming character. Shay, the owner and wine maker was doing our tasting, and explained her family’s history and her philosophy on simple, extremely small lot wine making. I won’t go into this much, as Megan will be writing more about this on her blog Wine Conscience in the next couple of days. Currently, all the fruit is being sourced and produced at Breaux Vineyards (we visited them the next day) but Shay oversaw the wine making decisions. Thanks to Shay for showing us around, we were glad to be a part of their opening weekend and can’t wait to see what they offer in the future. Stay tuned later this week for our visits to Breaux, Notaviva, Sunset Hills, Corcoran, Cross Keys and Pollack. Wine and art are a great combination for a couple of reasons. First and foremost, wine is one of my passions and my wife is by passion and schooling an artist (she got her Master of Fine Arts in sculpture and photography). Second, wine is a work of art in itself, a delicious liquid that walks a fine line between art, science, and Mother Nature. Imagery Estates Winery, which is in the Sonoma Valley just outside of Glen Ellen, took wine and art to a new level. If you read this blog you know that Megan and I are members of the Imagery wine club and get their wine 4 times a year. After drinking their Malbec recently, which is one of the wines in their artist collection, I decided that I should post not only about the wine, but about how Imagery marries wine and art perfectly. Labels for the Imagery Artist Collection wines are produced from artwork commissioned from among the world’s most notable contemporary artists. 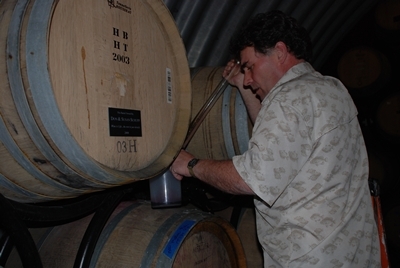 The original one-of-a-kind works of art are the property of Imagery Estate Winery. 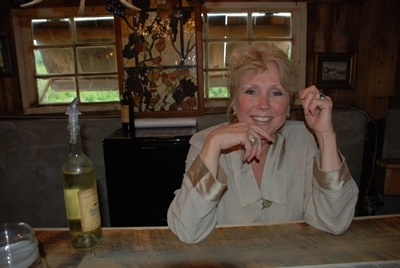 The collection, currently numbering 190, is on permanent display at the winery’s on-site gallery. Not all of the wines that come from Imagery are part of the artist series, but a good percentage of the wine club deliveries bear a one of a kind, artist designed label. Here are some of the ones that we have gotten in the past 2 years. The only requirement is that the art contain the Imagery symbol of a Pantheon. Some labels are easier than others to see the Pantheon design but sometimes finding them is part of the fun. All the labels have full scale paintings for sale and are on display in the Imagery Tasting room, providing an excellent backdrop to their hand crafted wines. The 2004 Malbec is from vines grown in Lake County. After harvest the grapes were fermented for 28 days using a pumpover method before the wine was put into French Oak barrels for 20 months. This wine was bottled in June of 06 and came in our September 2007 shipment. If you are in the Sonoma Valley doing some wine tasting make sure that Imagery is one of your stops, I am sure you won’t be disappointed. Click one of the icons below to add this post to your favorite Social Bookmarking site! Today, I thought it would be fun to put the word winery into a Google search and see what the #1 link is after the search. Now of course I have put the word winery into Google before, but never all by its lonesome. So I typed in winery, hit enter, and the top return from the search was for All American Wineries Dot Com. I don’t know why I thought that I would’ve been to the website that came back as #1 before, but for some reason I was shocked when I had not even heard of All American Wineries (AAW). This astonishment was further elevated after I found out what AAW is, a website dedicated to helping wine enthusiasts with their touring of wine country. The tagline for the website is “A Winery and Vineyard Guide by State for Wine Lovers in the US.” Aimed at wine lovers trying to find “hidden gems” within wine countries across the the United States, AAW was a “retirement” project for Bob H. After a long life of loving, living and enjoying wine, Bob wanted to do some traveling through wine regions that he had not yet had a chance to explore during his 30 years of government service. He quickly became frustrated with the lack information that lay on the World Wide Web, and thought to himself that he could do a much better job. He set out to compile information both on wineries around the US as well as those things that compliment wine tourism such as restaurants and lodging choices. Bob has done a great job and the already expansive list is growing all the time. His no frills, information only website has garnered accolades from the Seattle Times and USA Today to name a few as well as being inducted into the Top 100 Wine Sites Hall of Fame. I must be in the minority because according to their website, as of December 1st 2007 the site has had almost 13 million hits and has as steady Google page rank of 4. So don’t be left in the dark like me, give All American Wineries Dot Com a visit now, or the next time you plan to head to wine country. Another interesting tid-bit from my Google search of the word winery, is that of the top 10 links returned, TWO were for Virginia wineries. Number 6 was Chateau Morrisette and number 10 was Williamsburg Winery, GO VIRGINIA! All you winery visitors out there need to check out this great site that helps keep you informed on wineries in almost all 50 states. Just click on the state and it will show you how many wineries there are in that state, then click on a winery, and depending on what information the winery has provided it will show you hours of operation, upcoming events and more. It is a great site, and it’s free.